Regulation (EC) No 661/2009 repeals Council Directive 78/549/EEC of 12 June 1978 on the approximation of the laws of the Member States relating to the wheel guards of motor vehicles (3). The requirements set out in that Directive should be carried over to this Regulation and, where necessary, amended in order to adapt them to the development of scientific and technical knowledge. The scope of this Regulation should be in line with that of Directive 78/549/EEC and thus limited to vehicles of category M1. Regulation (EC) No 661/2009 lays down fundamental provisions on requirements for the type-approval of certain motor vehicles with regard to wheel guards. Therefore it is necessary to also set out the specific procedures, tests and requirements for such type-approval. This Regulation applies to motor vehicles of category M1, as defined in Annex II to Directive 2007/46/EC. ‘snow traction device’ means a snow chain or other equivalent device providing traction in snow, which shall be able to be mounted onto the vehicle's tyre/wheel combination and which is not a snow tyre, winter tyre, all-season tyre or any other tyre by itself. 1. The manufacturer or his representative shall submit to the type-approval authority the application for EC type-approval of a vehicle with regard to wheel guards. National authorities shall permit the sale and entry into service of vehicles type-approved before the date referred to in Article 13(2) of Regulation (EC) No 661/2009 and continue to grant extension of approvals to those vehicles under the terms of Directive 78/549/EEC. (3) OJ L 168, 26.6.1978, p. 45. Information document No … relating to the EC type-approval of a motor vehicle with regard to wheel guards. (8) The mass of the driver and, if applicable, of the crew member is assessed at 75 kg (subdivided into 68 kg occupant mass and 7 kg luggage mass according to ISO Standard 2416 - 1992), the fuel tank is filled to 90 % and the other liquid containing systems (except those for used water) to 100 % of the capacity specified by the manufacturer. (9) Delete where not applicable. (10) Delete where not applicable. (11) If the means of identification of type contains characters not relevant to describe the vehicle, component or separate technical unit types covered by this information document, such characters shall be represented in the documentation by the symbol ‘?’ (e.g. ABC??123??). (12) As defined in Directive 2007/46/EC, Annex II, Section A. The motor vehicle shall be provided with a wheel guard for each wheel. The wheel guard may consist of parts of the bodywork or separate mudguards and shall be so designed as to protect road users, as far as possible, against thrown-up stones, mud, ice, snow and water and to reduce the dangers due to contact with rotating wheels. The wheel guards shall meet the following requirements with the vehicle's mass adjusted to that of the manufacturer's declared mass in running order with one additional passenger on the first seating row and the steered wheels in the straight ahead position. In the part formed by radial planes at an angle of 30° towards the front and 50° towards the rear of the centre of the wheels (see Figure 1), the overall width (q) of the wheel guard shall be at least sufficient to cover the total tyre width (b) taking into account the tyre envelope as well as the extremes of the tyre/wheel combination(s) as specified by the manufacturer. In the case of twin wheels, the tyre envelopes and total width over the two tyres (t) shall be taken into account. For the purposes of determining the widths referred to in paragraph 2.1.1, the labelling (marking) and decorations, protective bands or ribs on tyre walls are not taken into account. In case of single wheels, the intersection of the rear edge of the wheel guard with the horizontal plane as defined in paragraph 2.1.2 (see Figure 1, point A) shall lie outwards of the median longitudinal plane of the tyre. In the case of twin wheels, the intersection of the rear edge of the wheel guard with the horizontal plane as defined in paragraph 2.1.2 (see Figure 1, point A) at the outside wheel shall lie outwards of the median longitudinal plane of the outermost tyre. 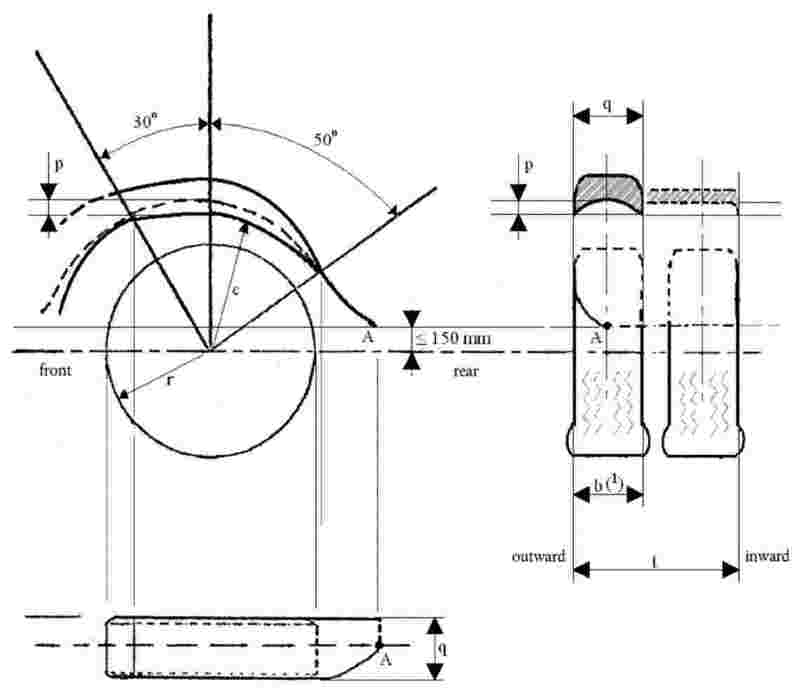 The depth (p) of the recess situated in the vertical plane of the tyre axis, measured from the outward and inward edges of the wheel guard at the vertical longitudinal plane passing through the centre of the tyre inside the wheel guard, shall be at least 30 mm. This depth (p) may be reduced progressively to zero towards the radial planes specified in paragraph 2.1.1. The distance (c) between the lower edges of the wheel guard and the axis passing through the centre of rotation of the wheels shall not exceed 2 × r, where the radius (r) is the static radius of the tyre. In the case of vehicles having an adjustable suspension height, the abovementioned requirements shall be met when the vehicle is in the normal running position as specified by the vehicle manufacturer. The wheel guards may consist of several components, provided that no gaps exist between or within the individual parts when assembled. The wheel guards shall be firmly attached. However, they may be detachable either as a unit or in parts. In the case of vehicles where only two wheels are driven, the manufacturer shall certify that the vehicle is so designed that at least one type of snow traction device can be used on at least one of the tyre and wheel combinations approved for the driven axle of the vehicle. The snow traction device and tyre/wheel combination(s) suitable for the vehicle type shall be specified by the manufacturer under item 6.6.4 in the information document. In the case of vehicles where all wheels are driven, including vehicles where drive axles can be disengaged either manually or automatically, the manufacturer shall certify that the vehicle is so designed that at least one type of snow traction device can be used on at least one of the tyre and wheel combinations approved for the driven axle, which cannot be disengaged, of the vehicle. The snow traction device and tyre/wheel combination(s) suitable for the vehicle type shall be specified by the manufacturer under item 6.6.4 in the information document. The vehicle manufacturer shall include relevant instructions regarding the correct use of the specified snow traction devices in the vehicle handbook and this information shall be given in the national language, or at least one of the national languages, of the country in which the vehicle is offered for sale.